The Maine Woods Dashboard is a collaborative effort to gather and display diverse information about Maine's forests in a way that helps residents, visitors, businesses, scientists and policy-makers better understand current conditions and historic trends. 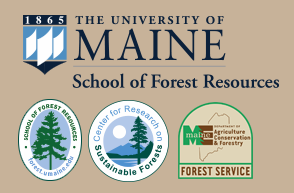 We have divided forest-related information into four main categories that describe the uses and values of Maine's Forests: Recreation & Tourism, Conservation Lands, Forest Products, and Family Forests. This website makes no warranty, representation, or guaranty as to the content, accuracy, timeliness, or completeness of any of the data provided at this website. Underlying issues may be present in data. Use this data at your own discretion.